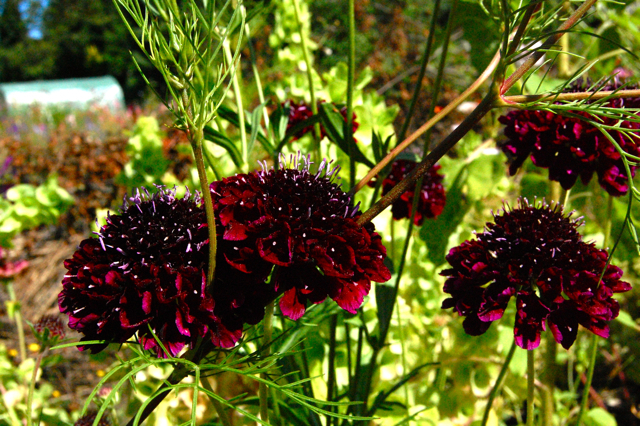 I’ve been looking for a very dark scabiosa to add to the flower garden. ‘Back In Black’ more than fits the bill…not only does it have incredibly rich and dark flowers but also has good height and strong stems. Adding to these fine qualities it is also a very prolific flower and just keeps on giving up blooms all summer. Try showing it with zingy green foliage plants like Bupleurum and Nicotiana ‘Lime Green’…oh yes indeed…these will get you wiggling with delight. Yes….it was named after the AC/DC tune…that’s how rock and roll it is …. *Sow March to May and September/October.